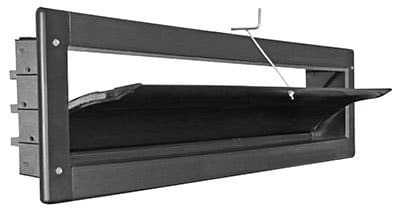 DirectAire European Curved Inlets have an aerodynamic, curved louver blade that directs fresh air along ceiling to ceiling peak for effective air mixing and speeds air to the center of even wider poultry houses. Its recessed design delivers 70% more air than conventional inlets, reducing total number of inlets needed. 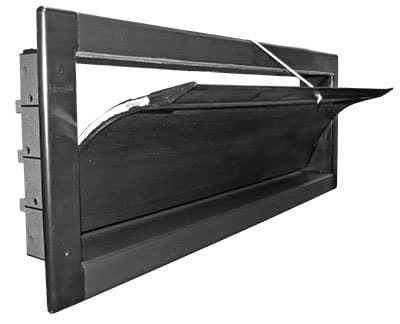 DirectAire Wall Inlets are great for reducing or eliminating bird drafting and saving on heating costs since the DirectAire Inlets are fully sealed against air leakage and light. During operation, DirectAire Inlet's airflow is directed through inlet's opening rather than leaking out bottom and sides of inlet. Framed Opening: 42" x 8.25"
Actual Inlet Size: 41.5" x 7.75"